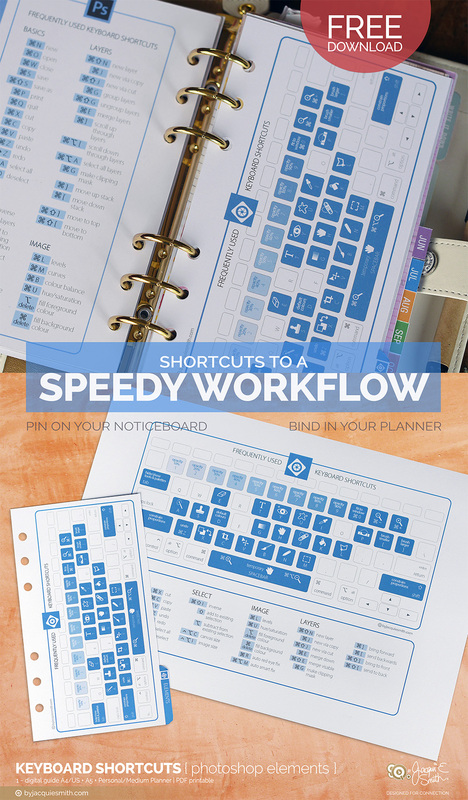 The Photoshop Elements Keyboard Shortcuts printable is perfect on your desk or in your planner. Last time we looked at Photoshop keyboard shortcuts. Today it is Photoshop Elements’ turn to be in the spotlight. PSE or Elements as it is commonly called, is a power-packed value for money application. It is the little cousin to Photoshop. I have always been amazed at how much functionality this program offers. No matter which application you use, learning keyboard shortcuts will save you tonnes of time. There are many shortcuts that are the same in both Photoshop and Elements. This is very handy should you find yourself needing to switch between the two. I really like how the basics are the same for the majority of applications on my Mac, not just for the Adobe products. To help you get started or to add a few more to your bank, I have created a Photoshop Elements Keyboard Shortcuts printable for your desktop or planner. The keyboard highlights the tools and their corresponding keys along with a few of my most used keyboard combinations. Not all of them could fit on the graphic so I included a list of other handy shortcuts. The basics shortcuts apply to programs in general. The select, image and layers shortcuts are specifically for Elements. The list is on the reverse side of the planner inserts. When I first started learning shortkeys the symbols use to trip me up. To help you become familiar with them I have used the symbols for command, option/alt, shift and control instead of writing them. The printable for your desk is for both US Letter and A4 paper sizes. The planner dividers come in two sizes. The first is what I call Personal: 95x170mm and fits Websters Pages “Color Crush“, the Kikki K “Medium” and Filofax “Personal and Slimline” planners. The second is Medium: A5 for 5.75×8.25″ planners and fits the Kikki K “Large“and Filofax “A5“. If you want to know more about planner sizes, please see my FAQs. 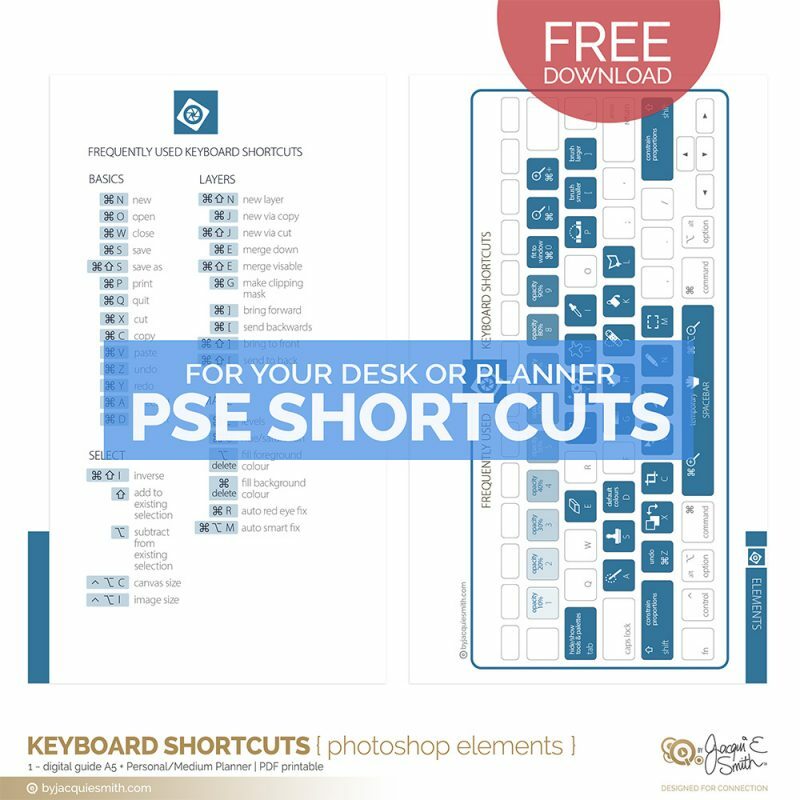 Download your free Photoshop Elements Keyboard Shortcuts printable for your desk or planner. Add learning one keyboard shortcut each week and speed up your workflow. Receive a bundle of free digi planner printables + craft supplies when you sign up for the community newsletter. Learn more here!